Audio Kinetica is a large glass box, inside of which a number of balls (I counted eighteen) are rolling around on wire tracks, knocking on bells, pushing levers, cascading over xylophones and doing a lot more than I can describe here. A vertical conveyor belt picks up the balls at the bottom and releases them at the top, sending them on their journey through a series of T-junctions that introduce a bit of randomness to their path. There are only two possible manipulations with this exhibit: a lever that, when pulled, blocks the flow of balls somewhere near the top; and a wheel that, when turned, lifts and drops a hammer onto a lever that then catapults a ping-pong ball into a wire funnel – sometimes. 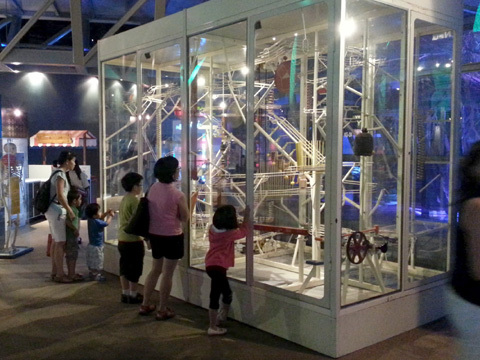 Kids and adults alike approach the ball machine with a look of curious excitement. It looks and sounds attractive with its lights and colours, and the aparent chaos of wires and bells is intriguing people from afar. Once they are close, they are hooked. While I sit here, observing, a small boy is running back and forth around the machine, desperate not to miss anything, shouting “Daddy, there, there!” He’d been here a few minutes before but was dragged away by his father who told him that “inside there is better”, referring to the iSpace exhibition. They were soon back to watch the ball machine. … I wish I had this at home! This exhibit is packed with opportunities for learning, discovery, hypothesis building and observation of all sorts of aspects of physics, and the visitors are naturally drawn to do all that, while having fun doing it. The one thing I did not see anybody do was to read the description of the exhibit. They didn’t have to!